Record low temperatures and unseasonable rainfall over the past week were a glimpse into the potential, intensifying effects of climate change in Cambodia, experts said, a phenomenon that studies suggest could seriously hinder future agricultural productivity through flooding, unpredictable rains and warming of up to 5 degrees Celsius by 2050. 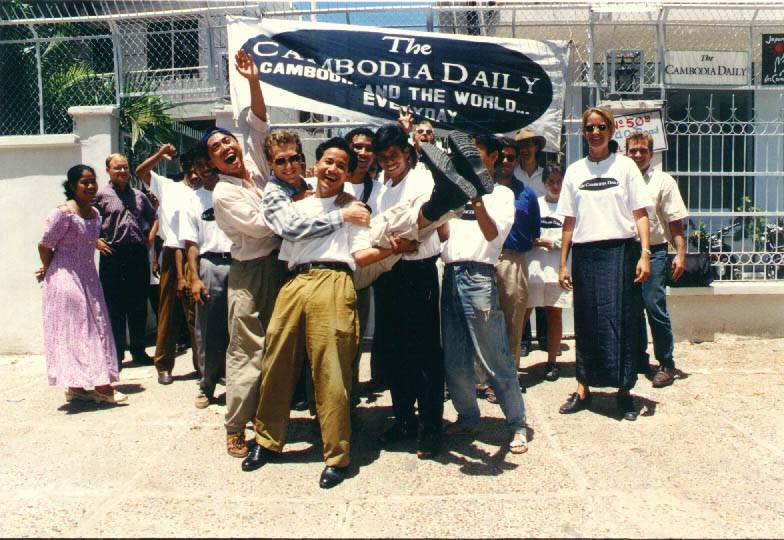 Khieng Sochivy, manager of the NGO Forum SYD, which focuses on human rights and climate change, said heavy rain over Khmer New Year was an occurrence he had never before seen. The eastern plains of Cambodia are given special mention, and are forecast to experience the country’s highest surge in temperatures, of up to 5 degrees Celsius. This will inhibit the region’s ability to grow cassava, soybeans and maize, the study says. A report by the German Society for International Cooperation, released in February, found about half of Cambodia’s roughly 9 million economically active citizens rely on agriculture for income and food security. All of them are potentially exposed to the consequences of changing weather, the report says. Those consequences include drought, flooding, unpredictable rains and tropical storms, all of which impinge on agricultural productivity, according to the report. For Touch Vannay, a 45-year-old tuk tuk driver whose family owns about 2 hectares of rice fields in Prey Veng province, the heavy rains are already a concern. Mr. Vannay said that his family members, who live and cultivate rice fields in Ba Phnom district’s Rong Damrei commune, were worried because early rain makes crops susceptible to armyworms. The destructive pest thrives in periods of drought followed by heavy rain, according to Australia’s Department of Agriculture and Fisheries. “It is very unpredictable,” Mr. Vannay said. Can Vichet, the program manager for the Cambodia Climate Change Network, said that Cambodia’s agriculture sector is susceptible to climate change due the country’s lack of irrigation infrastructure and reliance on erratic monsoon rains. Cambodian farmers are beholden to planting seeds at traditional periods of the year, the legacy of a bygone era when rains were supposedly more predictable in their cycle, he said. “Traditionally, farmers plant their rice crop in May. If it doesn’t rain, then their entire crop is wasted, and they lose all the money they paid for the seed and materials,” he said. Domestic climate change is not the only factor creating a tough commercial environment for the country’s farmers. In August and September, a sudden slump in global rice prices created a crisis in which Cambodian farmers struggled to turn a profit on their crop, with many unable to sell at all. 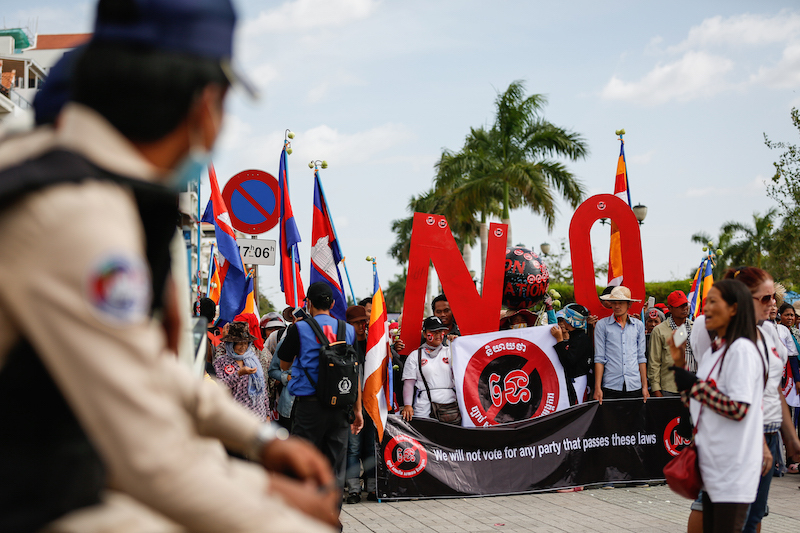 Following farmer protests, Prime Minister Hun Sen sanctioned an emergency $27 million cash injection for the rice sector, even appealing to the country’s more monied citizens to buy large volumes of Cambodian rice to help the industry get back on its feet. The episode is indicative of a wider problem within the agricultural sector, which has deviated from growth to stagnancy over the last 14 years. After steady expansion of 5.8 percent each year from 2003 to 2013, the country witnessed sluggish growth of less than 1 percent through 2015, contributing zero to GDP growth, according to World Bank data. A new World Bank report, published on Thursday, found that agricultural performance improved slightly last year, with rice yields increasing 8.9 percent from the year before, largely due to settled weather, the report says. 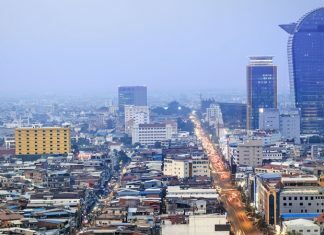 Miguel Sanchez Martin, Cambodia’s senior country economist for the World Bank, said that climate change was not specific to Cambodia, and that the issue would continue to threaten the country and required action. “It is not an immediate risk, but it needs to be addressed soon,” Mr. Sanchez Martin said. 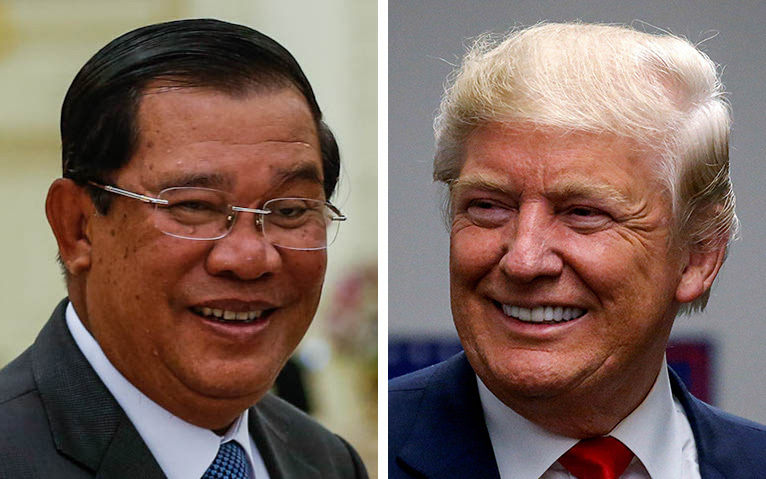 “Cambodia should look to increase productivity and diversify crops…and improve irrigation,” he said, adding that despite a boost in yield last year, a drop in global commodity prices had affected growth and would continue to pose future risk if the recommended steps were not taken. One possible challenge to boosting productivity is that higher temperatures have been shown to affect more than just rain cycles, also potentially worsening the working conditions and productivity of millions of the country’s agricultural workers. A study into the effect of heat stress on sugarcane workers in Kompong Cham province, currently undergoing peer review, found that a temperature increase of less than 2 degrees Celsius decreased worker productivity by 42 percent, due in large part to heat exhaustion. 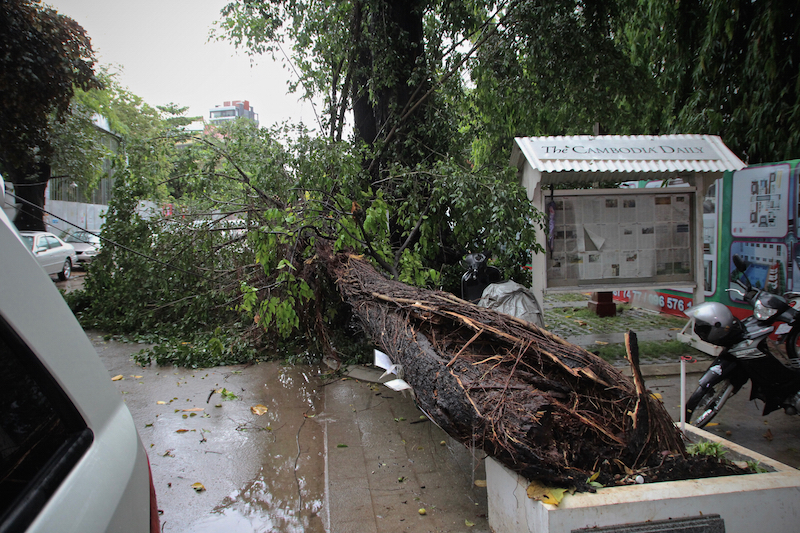 Kongkea Phan, who is dean of the science and technology faculty at Phnom Penh International University and led the research, said that the study signposted a potentially huge problem if the climate warms over the next 30 years as expected. “The study can apply to rice, sugarcane and cassava workers, as the workers are out in the sun all day,” Mr. Phan said, adding that more data was needed to help inform government policy on how to improve Cambodian agriculture’s economic viability and health guidelines. Lord Reasmey, spokesman for the Agriculture Ministry, said he was aware of the country’s climate change problems, and that the ministry had plans in place to try and negate repercussions in future. “Cambodia has experienced climate change since 2002 when there was a drought due to an El Nino,” Mr. Reasmey said, referring to the El Nino weather system, which oscillates and therefore temporarily shifts climate patterns. The extent of the shift determines the weather in the Pacific Ocean and countries along the equator, including Cambodia. Mr. Reasmey added that the government had initiated a climate change action plan that included public information campaigns, research into drought resistant seeds and a bid to diversify the country’s crops. “[We are] increasing awareness of the risk in the agricultural sector to our people and making them understand about climate change,” he said. Mr. Vichet, of the Cambodian Climate Change Network, said the government, possibly through the Water Resources and Meteorology Ministry, would do better at informing farmers about the optimum time to plant their crops. Mr. Sochivy, of Forum SYD, agreed, but also acknowledged that the Agriculture Ministry and National Committee for Disaster Management had disseminated information to increase awareness. “The people have more knowledge about climate change…but they still lack the ability to transform their activities, and need help from the relevant authorities,” he said.